Radoslaw Sikorski (lead image, right) plotted with the owner of Polish coalmines and electricity plants to use European Union sanctions against Russia to stop imports of rival, low-cost Russian coal in the Polish market. A clandestine tape-recording of a conversation between Sikorski, who was Poland’s foreign minister at the time, and Jan Kulczyk (lead image, left), one of Poland’s wealthiest businessmen, appeared in Warsaw this week. It reveals the first direct evidence that Sikorski, one of the most outspoken advocates of economic war against Russia, was engaged in war profiteering for himself and his friends. The Polish television channel Telewizja Republika released the transcript of the 4:41-minute conversation between Sikorski and Kulczyk on Wednesday. It can be followed here. At minute 2:39 Sikorski told Kulczyk: “Wiesz, najlepsza sankcja to by bylo wprowadzic zakaz importu rosyjskiego wegla do Unii europejskiej”. 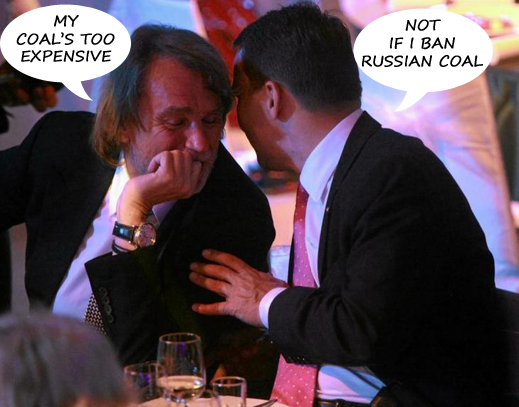 In English Sikorski was saying: “you know, the best sanction would be the ban of Russian coal in the European Union”. Sikorski was replying to Kulczyk’s revelation that he had been complaining to the Treasury Minister Włodzimierz Karpiński that electricity was too cheap in Poland for Kulczyk’s energy companies to make a profit. Kulczyk was one of Poland’s oligarchs; by Forbes’s count, the richest in the country. His holdings in Poland, Luxembourg and elsewhere included coalmine concessions, a coal port, chemicals, highway construction, and energy generation in Poland; oil wells in Nigeria; and gasfield exploration in South America. Allegations of his corrupt involvement in the privatization of PKN Orlen, the Polish oil trader, and of corrupt relationships with Polish politicians have been reported for more than a decade. No charges were ever brought against him at home. Net wealth estimates in the billions of Euros are suspect, because his debts were reportedly considerable. Kulczyk died on July 28 this year; this followed unexpectedly after surgery in Vienna. For more on Kulczyk’s plotting to make a profit out of Ukrainian assets, and the decline of his Ukrainian fortunes in eastern Ukraine, after the civil war began, read this. 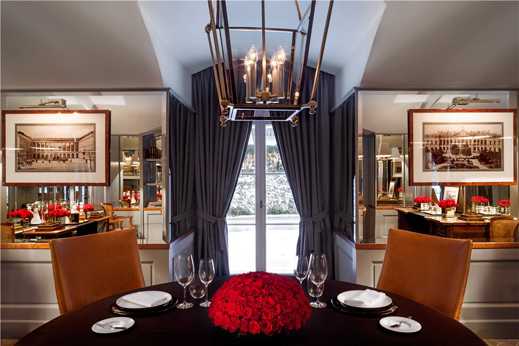 The tape-recording was made during a lunch Sikorski and Kulczyk were having at the Amber Restaurant in Warsaw. This is part of the Sobanski Palace, headquarters of the Polish Business Roundtable (Polska Rada Biznesu). Warsaw sources believe they were in a private dining-room. The date of the recording is unclear. Warsaw sources who have analysed the internal references believe the conversation took place between April and May of 2014. The Sikorski-Kulczyk plan of attack on Russian coal exports to Poland, and its gas in storage in Ukraine, was on the table in Warsaw weeks before the US and EU decided to expand the sanctions to the so-called “sectoral” measures. When first introduced in July, they attacked capital raising, arms trade, and oil technology. Coal and gas were in Sikorski’s gunsights; they weren’t yet agreed with Washington, London, or Berlin. In mid-August 2014 Sikorski went public with a call for a ban on Russian coal imports to the EU. The Russian media immediately reacted. But on August 15 the EU ministers turned down Sikorski’s proposal. He himself lost his job a month later, in September, when he was replaced as foreign minister, and given the job of Speaker of the Sejm. He was forced from that job in June this year. For more on Sikorski’s downfall, read the archive. The full transcripts of the restaurant tapes were evidently known to Polish and foreign intelligence agencies well before Sikorski was removed from the Foreign Ministry. The link he made between his proposal to ban Russian coal imports as an EU sanction, Kulczyk’s profit, and Sikorski’s private relationship with Kulczyk may have already been known to government officials – and covered up. Kulczyk himself had been blunt publicly in admitting Polish officials were on the take. ” Sprzedajni pajace ( “clowns for sale”) he called them. When excerpts of the tapes were first released last year, Sikorski, Karpinski and several other ranking officials recorded on the tapes were dismissed by the then prime minister, Eva Kopacz. At the time, Sikorski appeared to have been ousted because of his scatological references to President Barack Obama and Prime Minister David Cameron. For details, read this. This week’s new disclosure uncovers the possibility of a corrupt relationship between Sikorski and the oligarch. If Sikorski was receiving inducement from Kulczyk – and if the Polish authorities suspected it — this is not known nor alleged in Polish media reporting of his downfall. The coal sanction wasn’t the only official favour Sikorski discussed with Kulczyk. This transcript, released in Warsaw on November 5, indicates that Kulczyk told Sikorski of a scheme which he hoped to arrange between Ukraine and Poland. “We can have three thousand megawatts [of electricity]. This is, you know, 10 percent of Polish power at very good prices.” Several obstacles stood in Kulczyk’s way, he told Sikorski. One was Rinat Akhmetov, the Ukrainian oligarch, who he said controlled a large part of the Ukrainian energy market (through his DTEK holding). Sikorski replied there was a solution — Akhmetov “can be screwed in Kiev”. Kulczyk agreed, revealing that he had already agreed with “a friend of [Prime Minister Arkady] Yatseniuk” on terms of a deal. “They want me for 20 years to sell all the electricity from the nuclear power plants.” Kulczyk mentioned the names of other Polish and Ukrainian officials with whom he was negotiating his deal. He then told Sikorski cheap coal from Russia, Australia, and Kazakh was undercutting his scheme. This is the context in which Sikorski came up with his idea for “the ban of Russian coal in the European Union”. 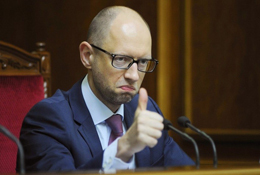 Blocking the delivery of Russian gas into Ukraine, substituting other sources of gas supply, and reselling Gazprom’s gas in current storage – these were also schemes Kulczyk was pitching to Sikorski to ask for his official support. The published transcript stops before Sikorski’s answer is revealed. In September Polish coalminers tried to block the delivery of imported Russian coal to electricity plants; the protest appears to have had Polish government backing, and was amplified on Polish state radio. Weeks later a bill to introduce licensing and other restrictions on Russian coal imports was introduced into the Sejm. By then Sikorski was presiding as Speaker. By the time Sikorski had persuaded some of the deputies to back the Kulczyk scheme, devaluation of the rouble in Moscow was dramatically lowering the price at which Russian exporters could ship and sell their coal to Poland. This helped Russian coal exporters compete globally as the world market price for coal also plummeted. The Russian customs figures show that export volumes to Poland were roughly stable at the 3-million tonne mark in 2012, 2013, and 2014. Shipments to Germany have been growing. In Moscow, coal industry sources acknowledge the attempts by Polish businessmen and politicians to stop Russian coal imports under cover, they say, of the war in the Ukraine. This year they acknowledge that although Russian coal production is up by a small margin, exports are down. Overall, the Russian exporters say the impact on their European and Asian markets has been small. But in Poland, Polish and Russian sources agree, there has been a concerted effort to reduce Russian coal imports, and substitute domestic supplies. Polish imports of US coal have also been rising this year. Forced out of post, income, and repute in Poland, Sikorski is to be employed by Harvard University, sources reported in Warsaw today. 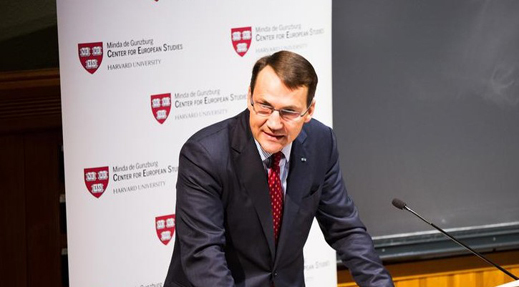 NOTE: Shortly after this story was published, Harvard University issued a press release entitled “HARVARD’S CENTER FOR EUROPEAN STUDIES APPOINTS RADOSLAW SIKORSKI AS SENIOR FELLOW.” Read it in full. It is dated November 7, the day after it was issued. According to Gila Naderi, spokesman for the Centre, the announcement had not been rushed out after the Polish press began reporting Sikorski’s appointment. “The appointment had been in the works already for several weeks,” Naderi said. Asked what the terms of Sikorski’s appointment are, Naderi said he will not be employed. “This is an advisory appointment, an honorary one. He will not be paid.” Naderi added the Centre had been responsible for reporting in its press release: “In February 2014, together with the foreign ministers of Germany and France, Sikorski initiated mediation in the Ukraine crisis, which let [sic] to the end of three months of violent protests and clashes.” Asked to explain why she had omitted to mention the 20 months of civil war which has followed Sikorski’s mediation, Naderi cut the telephone line.